Analysis: Given his sizable cap hit and minimal 2018 contribution, it's surprising to see Smith keep his place on the roster without accepting a pay cut. The Panthers could change their minds later this offseason, as Smith's 2019 compensation consists solely of a non-guaranteed $5 million base salary, per overthecap.com. The 30-year-old wideout figures to serve as a low-volume deep threat if he stays with the Panthers. Analysis: Smith inked a three-year, $15 million contract with the Panthers this offseason but failed to deliver much on that substantial investment. In fact, the 29-year-old set career lows in all major receiving categories. It'll be interesting to see whether Carolina decides to bring him back for the 2019 campaign. Analysis: Smith overcame his knee injury to be active Sunday, but he still hardly got to see the field. While his role has shrunk over the course of the campaign, as evidenced by three straight games without a catch, the extra day before Week 15's Monday night meeting against the Saints could do the veteran's knee some good. Analysis: After missing Weeks 8 through 11 while battling the knee issue, Smith has dressed for the last two contests but hasn't drawn a single target while playing a combined 22 offensive snaps. It would appear that Smith is setback-free coming out of those games, but the veteran seems unlikely to see his role expand much over the final quarter of the season with youngsters D.J. Moore and Curtis Samuel proving themselves worthy of increased responsibility in the Carolina passing game. 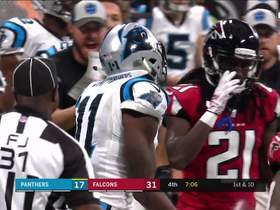 Analysis: Playing just 22 offensive snaps the last two games without being targeted, Smith has clearly taken a back seat within the Panthers offense. Based on the workloads of fellow wideouts this past Sunday, D.J. Moore (66 of 70 snaps on offense), Curtis Samuel (58), Jarius Wright (39) and Devin Funchess (32) are all ahead of Smith in the pecking order. A lingering knee injury isn't helping Smith's cause, but he appears to be on the outside looking in for reps.
Smith was not targeted in Sunday's 24-17 loss to the Buccaneers. Analysis: Smith played just nine of Carolina's 70 offensive snaps as the team welcomed Devin Funchess back to the fold. While Smith carried a knee injury during the week, his ability to practice in full last Thursday suggests he wasn't limited from a health standpoint Sunday. Nonetheless, with a reception in just five games this season, it's not like Smith is a reliable fantasy commodity anyway. Smith (knee) was a full participant in Thursday's practice, David Newton of ESPN.com reports. Smith (knee) was a limited practice participant Wednesday, Greg Auman of The Athletic reports. Smith (knee) started and played 13 of the Panthers' 59 offensive snaps (22 percent) in the team's 30-27 loss to the Seahawks. He wasn't targeted during his time on the field. Smith (knee) and D.J. 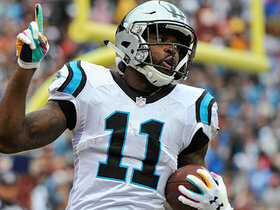 Moore will serve as the Panthers' starting wide receivers in Sunday's game against the Seahawks, Steve Reed of the Associated Press reports. Analysis: With Devin Funchess (back) sidelined this week, the Panthers won't be forced to make a tough decision between Smith and Moore for the other starting gig. However, with Smith coming off a four-game absence, he'll likely be subject to a limited workload, with Bill Voth of the Panthers' official site estimating the veteran will earn about 12 snaps. That caps Smith's fantasy upside in Week 12, with Moore and Curtis Samuel both representing higher-percentage plays among the Carolina wideouts. Smith (knee) is listed as active Sunday versus the Seahawks, Steve Reed of the Associated Press reports. Analysis: Although Smith is available for the first time since Week 7, this may be more of a test run to see if the veteran wide receiver can hold up. Bill Voth of the Panthers' official site predicts a small workload in the vicinity of 12 offensive snaps, which seems minimal with Devin Funchess (back) inactive. That said, the Panthers likely are confident the quartet of D.J. Moore, Christian McCaffrey, Greg Olsen and Curtis Samuel can maintain a suitable passing attack. Smith (knee), who is listed as questionable for Sunday's game against the Seahawks, is expected to play, Adam Schefter of EPSN reports. Analysis: If Smith suits up as anticipated, it would mark his first appearance since Week 7. His availability would be welcome news for a Panthers wideout corps that will likely be without top option Devin Funchess (back), who is listed as doubtful ahead of the contest. Analysis: Coach Ron Rivera said Friday he is "pretty confident" Smith will be able to play for the first time since Week 7. If so, the 29-year-old is returning at a convenient time, with fellow wideout Devin Funchess (back) listed as doubtful on the final injury report. Averaging just 4.5 targets on 45 snaps per game, Smith doesn't pose a real threat to D.J. Moore's workload. 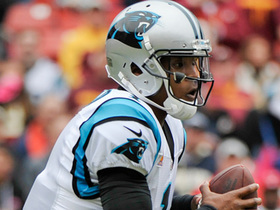 Smith (knee) took part in individual drills Friday, Bill Voth of the Panthers' official site reports. Analysis: Smith has practiced each day this week, but the report indicates he will likely be listed as limited Friday for the third straight day, which leaves his availability for Sunday's matchup with the Seahawks up in the air. Coach Ron Rivera sounded skeptical about Smith (knee) being ready to play Sunday against the Seahawks, Bill Voth of the Panthers' official site reports. Analysis: Smith returned to practice Wednesday as a limited participant, making his first appearance of any kind since he suffered a knee injury Nov. 21. He may have to settle for a minor role whenever he's ready to play, as young receivers D.J. Moore and Curtis Samuel have both looked good in recent weeks. Smith (knee) returned to practice Wednesday as a limited participant, Jourdan Rodrigue of The Charlotte Observer reports. Analysis: Smith's first practice appearance since Week 7 comes at a good time with fellow wideout Devin Funchess (shoulder) held out of the session and considered day-to-day. Regardless, the 29-year-old may need to settle for a reduced role when he rejoins the offense, as D.J. Moore and Curtis Samuel have provided a spark to the Carolina passing attack. Smith seems to be on track to return Sunday against the Seahawks. Smith (knee) has been ruled out for Sunday's game in Detroit, Max Henson of the Panthers' official site reports. Analysis: Listed as a non-participant throughout the week, Smith will sit out for a fourth straight game. Smith was able to resume running a few days ago, perhaps giving him a chance for a return Week 12 against Seattle. With Smith sidelined for at least one more contest, D.J. Moore will likely earn another starting assignment, while Curtis Samuel and Jarius Wright may also benefit from a few extra snaps. Smith (knee) was listed as a non-participant Thursday on the Panthers' estimated practice report, Steve Reed of the Associated Press reports. Analysis: Inclement weather prevented the Panthers from holding a true practice session as planned, as the team instead opted for a brief walk-through session. Smith's inability to complete that activity doesn't offer much encouragement about the health of his right knee, which seems likely to keep him sidelined again Sunday against the Lions. A final word on Smith's status for the weekend will come after the Panthers release their injury report following Friday's session. Smith (knee) was listed as a non-participant in Wednesday's practice, but was able to get in some work on the side with the Panthers' training staff, Jourdan Rodrigue of The Charlotte Observer reports. Analysis: Smith has resumed running and said Tuesday he feels much better, but he still seems to be in danger of missing a fourth consecutive game. D.J. Moore would be primed for another start if Smith can't play Sunday in Detroit. Smith (knee) said he has resumed running and is feeling much better, Joe Person of The Athletic reports. Analysis: Despite his optimistic statement, Smith was held out of practice Tuesday after missing the past three games. 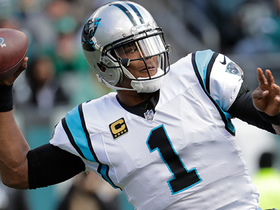 He does have three more chances to practice before the Panthers play in Detroit on Sunday, but him ultimately sitting out another game wouldn't surprise many people. D.J. Moore started each of the past three contests, catching 10 of 13 targets for 126 yards while adding 76 yards on four carries. Smith (knee) isn't practicing Tuesday, David Newton of ESPN.com reports. Analysis: The Panthers are starting practice for Week 11 a day early in the wake of last Thursday's blowout loss to the Steelers. Smith appears to be in danger of missing a fourth consecutive game, but he'll still have three more chances to get some work in before Sunday's game at Detroit. Another absence likely would allow D.J. Moore to start again. Smith (knee) has been ruled out for Thursday's contest at Pittsburgh, Joe Person of The Athletic reports. Analysis: The absence will be Smith's third in a row as a result of a knee injury. Because he hasn't practiced since Week 7, there's no telling when the veteran wide receiver will take the field again. In his stead, the Panthers have unleashed rookie D.J. Moore and Curtis Samuel on opposing defenses. Smith (knee) wasn't spotted at the portion of Wednesday's practice available to the media, Bryan Strickland of the Panthers' official site reports. Analysis: Smith was also listed as a non-participant in practice Monday and Tuesday, so it's looking likely that he'll miss his third straight contest Thursday against the Steelers. The veteran's expected absence should open up more snaps for young wideouts D.J. Moore and Curtis Samuel, both of whom have made impacts in both the passing and running games the last two weeks. Smith (knee) wasn't in attendance for the portion of Tuesday's practice available to the media, David Newton of ESPN.com reports. Smith (knee) didn't participate in Monday's walkthrough, Bill Voth of the Panthers' official site reports. Analysis: Smith hasn't practiced since injuring his right knee Week 7. Until he progresses to some activity, it'll be difficult to forecast a return to action, especially with a short week to prepare for a Thursday night affair in Pittsburgh. Smith's absence has paved the way for D.J. Moore and Curtis Samuel to emerge in the Panthers' passing attack. Smith (knee) has been ruled out for Sunday's game against Tampa Bay, Bryan Strickland of the Panthers' official site reports. Analysis: Smith will miss a second straight game after failing to practice in any capacity this week, and he may have a hard time getting ready for a Thursday night game against the Steelers in Week 10. His absence gives rookie first-round pick D.J. Moore a nice opportunity to build on last week's breakout performance, with 2017 second-round pick Curtis Samuel also projecting for added playing time. Smith (knee) was listed as a non-participant at Thursday's practice, Bryan Strickland of the Panthers' official site reports. Smith (knee) wasn't in attendance for Thursday's practice, Max Henson of the Panthers' official site reports. Smith (knee) didn't practice Wednesday, David Newton of ESPN.com reports. Analysis: Smith has been held out of all football activities since injuring his right knee Week 7. Until he returns to practice, it'll be difficult to forecast an appearance on gameday. If Smith remains sidelined Sunday against the Buccaneers, rookie D.J. Moore will assume a starting role opposite No. 1 wide receiver Devin Funchess yet again. Smith (knee) has been ruled out for Sunday's game against Baltimore, Joe Person of The Athletic reports. Analysis: Smith misses out on a chance to face one of his former teams, freeing up more snaps for D.J. Moore and Curtis Samuel behind No. 1 receiver Devin Funchess. The 29-year-old caught nine passes for 104 yards and a touchdown over the past two weeks, but this doesn't feel like a major blow to the Carolina offense given how little Smith did earlier in the season. Smith (knee) was not present for the portion of Friday's practice open to the media, according to Max Henson of the Panthers' official site. Analysis: Smith is hoping to play Sunday against the Ravens, but if he does not get in any work Friday after the media departs, he will not have practiced at all this week. The Panthers will reveal Smith's official status for Week 8 after Friday's practice comes to a close. Smith (knee) missed his second straight practice Thursday, but said he remains optimistic that he'll be ready to play Sunday against the Ravens, Bryan Strickland of the Panthers' official site reports. Smith (knee) didn't participate in Thursday's practice, Jourdan Rodrigue of The Charlotte Observer reports. Analysis: Smith hasn't required crutches or a brace to support the right knee he injured in the Week 7 win over the Eagles, suggesting that he's not dealing with too serious of a concern. 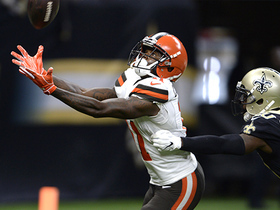 However, the wideout's absences from the first two practices of the week nonetheless cast some doubt about his availability for Sunday's game against the Ravens. The Panthers will see what Smith is able to do at their final practice session Friday before deciding on his fate for the weekend. Smith (knee) didn't participate in practice Wednesday, Steve Reed of the Associated Press reports. Analysis: Smith paid a visit to the X-ray room after Sunday's win at Philadelphia, but called himself "fine" afterward, per Joe Person of The Athletic. In the meantime, Smith hasn't needed crutches to move about or even a brace on his right knee, according to Jourdan Rodrigue of The Charlotte Observer. As a result, Smith's absence Wednesday may be a precautionary measure, with a decision on his upcoming availability to be made at the end of the week. Smith will be evaluated for a right knee injury Monday, Max Henson of the Panthers' official site reports. Smith (leg) gathered in four of six passes for 61 yards during Sunday's 21-17 win at Philadelphia. Smith caught all five of his targets for 43 yards and a touchdown in Sunday's 23-17 loss to the Redskins. Analysis: Smith's reception total only trailed Christian McCaffrey for the team lead, and only Devin Funchess played more snaps among Carolina's wideouts. 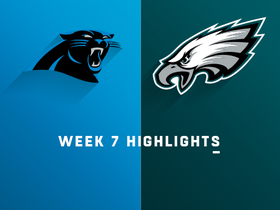 While his yardage total was still fairly modest, Smith's three-yard touchdown brought the Panthers within a field goal during the fourth quarter. Through five games, Smith has scored twice but produced just 110 yards on 12 grabs. Smith caught three of six targets for 19 yards in Sunday's 31-21 win over the Bengals. Analysis: Smith was one target behind Devin Funchess' team-leading total, but the veteran wideout didn't get much going as Carolina's offense did most of its damage on the ground. Heading into the Week 4 bye, Smith hasn't exceeded three catches or 33 yards in a game, though he did find the end zone Week 2. 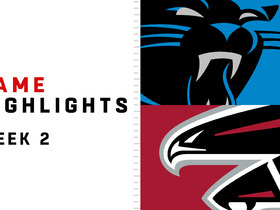 Smith caught three of seven targets for 33 yards and a touchdown in Sunday's 31-24 loss to the Falcons. Analysis: Smith found room in the red zone to haul in a three-yard touchdown early in the fourth quarter. He also went for a 26-yard gain on the day, and only Christian McCaffrey and Devin Funchess were targeted more. The available looks in the wake of Greg Olsen's (foot) absence could benefit Smith, but with Jarius Wright, D.J. Moore and Ian Thomas also vying for opportunities, Smith is one of a few complementary pieces in the team's passing attack. 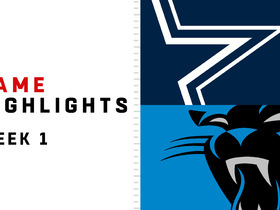 Smith caught one of his two targets for 15 yards in Sunday's 16-8 win over the Cowboys. Analysis: Smith was on the field for over 75 percent of Carolina's offensive snaps, trailing only Devin Funchess among wideouts. Despite that involvement, however, Smith didn't get much action in the passing game. With Greg Olsen (foot) facing an uncertain status, more targets could be available going forward, so Smith will aim to add to his workload as he continues to acclimate to new coordinator Norv Turner's scheme. Smith got the start in Friday's preseason game against Miami, catching his only target for a 12-yard gain. Smith is part of a Carolina receiving corps that added D.J. Moore in the first round of the 2018 NFL Draft, Joseph Person of The Charlotte Observer reports. The Eagles dealt Smith to the Panthers for cornerback Daryl Worley on Friday, Adam Schefter of ESPN reports. Analysis: The Eagles are well over the salary cap in advance of the new league year, so this transaction is no surprise. Getting compensation in the form of a young defensive back is merely icing on the cake. 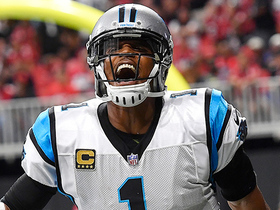 On the Panthers' side of the equation, Smith will slot in as one of Cam Newton's top targets, pending moves made in free agency and the draft. In seven seasons as a pro, Smith has averaged 16.4 YPC, but that number has fallen to 12.4 YPC the past two years. Smith hauled in five of nine pass attempts for 49 yards in Sunday's 41-33 win over the Patriots in the Super Bowl. Smith caught two of three pass attempts for 17 yards in Sunday's 34-29 win over the Giants. Analysis: After seeing his rapport build with Carson Wentz over the last several weeks, Smith's role was drastically reduced with Nick Foles under center, although the seven-year vet did edge Nelson Agholor in snaps, 51 to 49. The 28-year-old also managed to draw a pass interference penalty on a deep ball that set up the Eagles' first touchdown of the day two plays later. It will be tough to count on him against Oakland in Week 16. Smith caught six of 11 targets for 100 yards in Sunday's 43-35 win over the Rams. Analysis: Smith tied for the team lead in targets and led the way in receiving yardage, thanks in large part to a 46-yard gain to set up a field goal before halftime. He set season highs in every major category in this one, reaching 100 receiving yards for the first time since Week 2 of the 2015 campaign. Though Smith's involvement has trended upward of late, it remains to be seen how his fantasy stock would be impacted if Carson Wentz (knee) is forced to miss time. Smith caught five of seven pass attempts for 29 yards in Sunday's 24-10 loss to Seattle. Analysis: It was the most receptions Smith has had all year and the most targets he's seen since Week 2, yet it was still a disappointing result. While the 28-year-old has seen 12 of his 27 targets this season over his last three contests, he has not exceeded 30 yards receiving since Week 5. Zach Ertz's concussion may mean extra work for Smith Week 14, but the Maryland product is nowhere near a reliable fantasy option as most leagues head to the playoffs. Smith caught four of five targets for 30 yards in Sunday's 31-3 win over the Bears. Analysis: Smith seems to have moved beyond the drops which led to early-season talk of a demotion from the starting lineup, but he's still only the No. 4 pass-game option in a balanced offense that also features a three-headed monster at running back. The 28-year-old speedster has drawn more than five targets just once all season, averaging 2.0 catches for 25.4 yards on 3.5 targets per game. He'll face an injury-marred Seattle secondary on the road in Week 13. Smith caught three of four pass attempts for 28 yards and a touchdown in Sunday's win over the Cowboys. Analysis: The touchdown came from 11 yards out and put the Eagles up by two scores. Smith's yardage and target totals represent his highest since Week 5. However, the 28-year-old still saw fewer snaps than Nelson Agholor and is difficult to depend on for production week-to-week, especially if he can't string together a few good games in a row. He'll look to rebound against Chicago in Week 12. Carolina Panthers quarterback Cam Newton converts on fourth down while being tackled to wide receiver Torrey Smith for a 35-yard gain. 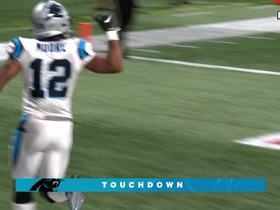 Watch the Carolina Panthers quarterback Cam Newton narrow the lead with successful two-point conversion. 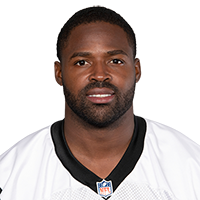 Watch Carolina Panthers wide receiver Torrey Smith sneak across coverage and run in touchdown. Carolina Panthers quarterback Cam Newton slings a pass to wide receiver Torrey Smith and he uses a stiff arm to pick up 26 yards. Carolina Panthers quarterback Cam Newton zips a 3-yard touchdown pass to wide receiver Torrey Smith.